Preliminary games were a combination of four- and five-player contests as attendance dictated. Three alternates were required for the Semi-Finals making all the fuss over MESE tie breakers seem overblown. Almost 50 players participated in the tournament this year, down 8% from last year as the event continued a three-year slide. No major scheduling issues (though being nearly the only event in Ballroom A on Thursday made things a bit confusing for some), but as hot new Euros come out, the older events always slide a bit. 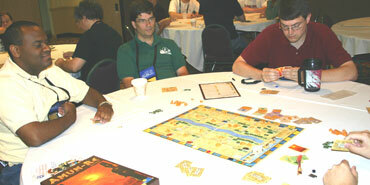 Four player games were played with the same three provinces removed before the game (Abydos, Amarna, and Kharga). Due to the removal for the 4-power-card province from the game, the requirement for the Power Card bonus card was reduced in those games, from 7 to 5 in the Heats and from 7 to 6 in the Semis and Final. Feedback indicated that 5 was a little too easy to get. The two heats saw 14 tables played, with three second-place players advancing as alternates when one winner declined to advance. The 16 semi-finalists each played a four player match, with the four winners advancing to the Final. The Final was a tense game. (A full recap will be posted online with the address listed here.) 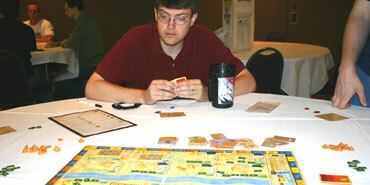 Greg Thatcher jumped out to an early lead as the only player with four pyramids, also scoring two temples and two scoring cards. However, he found himself short of cash and sacrificed the -3 all three rounds of the new kingdom, and Arthur Field managed to grab at least a tie for most pyramids on both sides of the Nile to eke out a 48-43 win. Sitting in a later seat proved a distinct advantage this year (1-0-2-4-2 by seat in five-player, 1-2-4-3 in four-player). Having the most pyramids remained no guarantee of victory (4-5 in five-player, 5-5 in four-player), but that was better than having the most cash, at least 5-player (1-8 in 5, 6-4 in 4). Halftime leaders didn't do as well as last year (4-5 in 5, 3-7 in 4). Then again, winning a game is only a 20 to 25% proposition to begin with, so even a 1-3 shot is an improvement. Arthur Field and Greg Thatcher combined for most of the highest scores 48,49,48 and 51,47,43), with Phil Rennert posting a 51 in a heat that included a 49 from Alex Bove (who lost his Semi-Final on a tie-breaker). Low scores were 19 and two 20s. Aside from one table average of 24.5, averages in the heats ranged from 30.75 to 40.4, with Semi-Finals of 35.25/36/40/40.75 and a Final of 40.75.More points were scored in the old kingdom than the new, which is not mathematically impossible due to scoring cards and different temple scoring, but in this case the numbers could not possibly be correct.